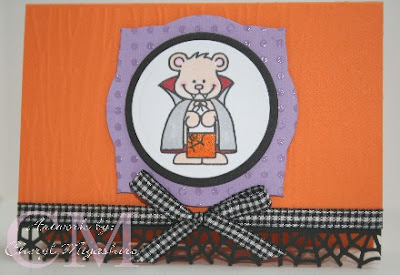 Over the Labor Day weekend, I made this card using another one of Jean's new stamps for Halloween. Baxter is all dressed up and ready for trick or treating and he vants some candy! I used the Cuttlebug woodgrain folder to emboss the background. On the purple piece of cardstock, I used Hero Arts dotted background stamp and clear embossing powder to make the image stand out and labels 3 nesties. The MS spiderweb border punch is so cute and punches well through cardstock. 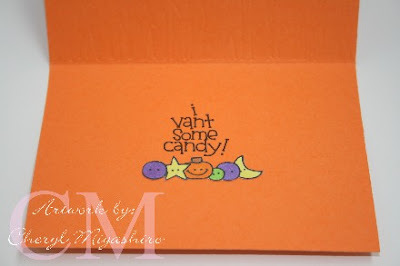 The word stamp and candies are also part of the new release from Dandelion Designs. Hope you have a vonderful day and thanks for stopping by!!! So adorable! I love that cute sentiment. Cute card. Love the MS spider web border punch! so cute and always in the mood for this halloween! love the cards and creations coming out! I need to CASE someone soon! TFS! Such a cute card! I'm totally loving that spider web border punch!! Baxter is a cutie! i just love him! Love what you did with him! Great job Cheryl! 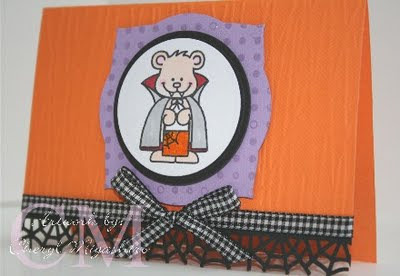 love your Halloween cards, especially the spider web punches! that wood grain sure does add to the card! Baxter's a cutie! Hi, thanks for your comment on my blog. Leave me your email address on my blog and I will email you some tips with the document. Too cute! Love the spiderweb border and I just bought this stamp from J's for a friend. He is a cutie! Cheryl thank you so much for my adorable card! It was so nice hanging out with you and thank you so much for inviting me! We have to do it again!